Charles Spurgeon is one of those preachers from the past that needs no introduction. Most have read, or at least heard of, his classic devotional called Morning and Evening. 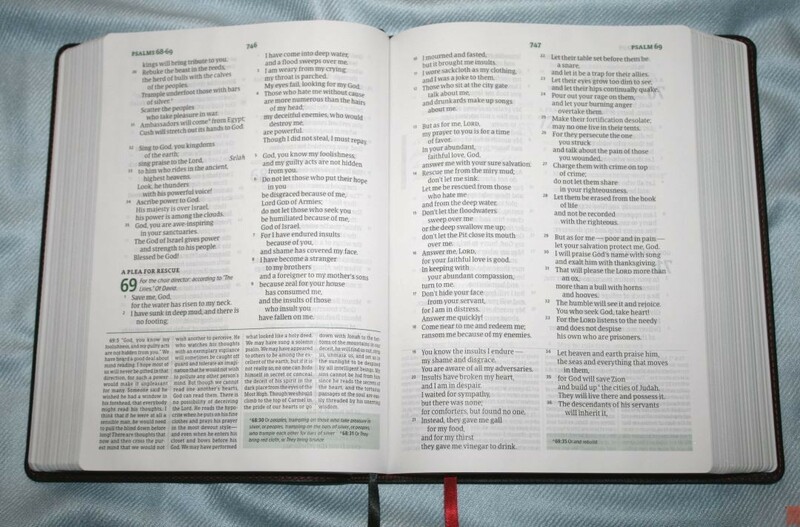 It’s one of the most, if not the most, popular devotionals available. Most of his writings and teachings have a devotional quality to them. That devotional quality shines in Holman’s Spurgeon Study Bible. 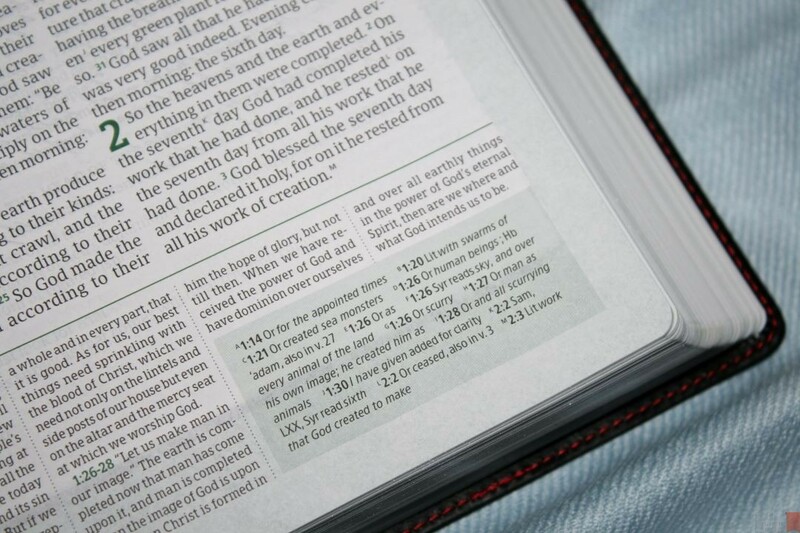 Alistair Begg chose and edited excerpts from Spurgeon’s sermons to create this Study Bible. It comes with four different covers (made in China). Holman provided this Bible free for review. I was not required to give a positive review, only an honest one. All opinions are my own. 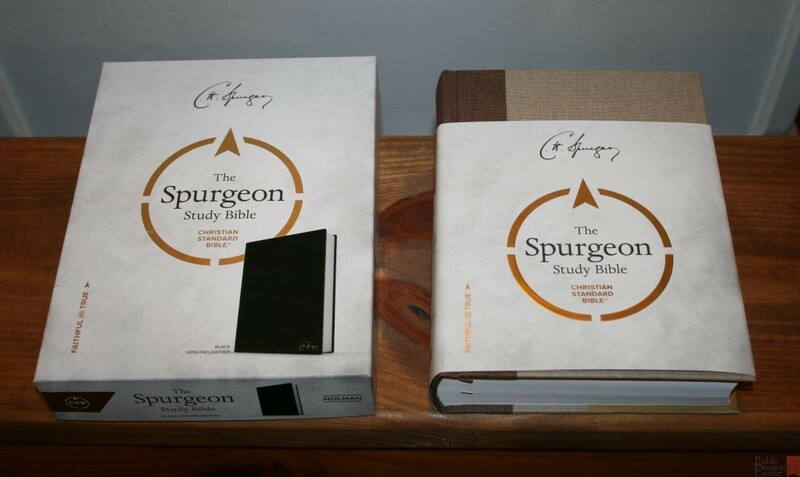 The Spurgeon Study Bible is available in several covers. All but the cloth over board have perimeter stitching. They have paper paste-down liners and each is Smyth sewn. They have no trouble lying open in Genesis. 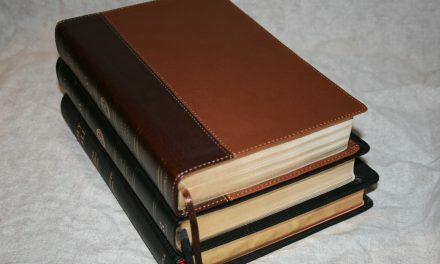 The imitation leather editions lie flatter because the spine of the cover allows the spine of the text-block to raise upward further than the others. 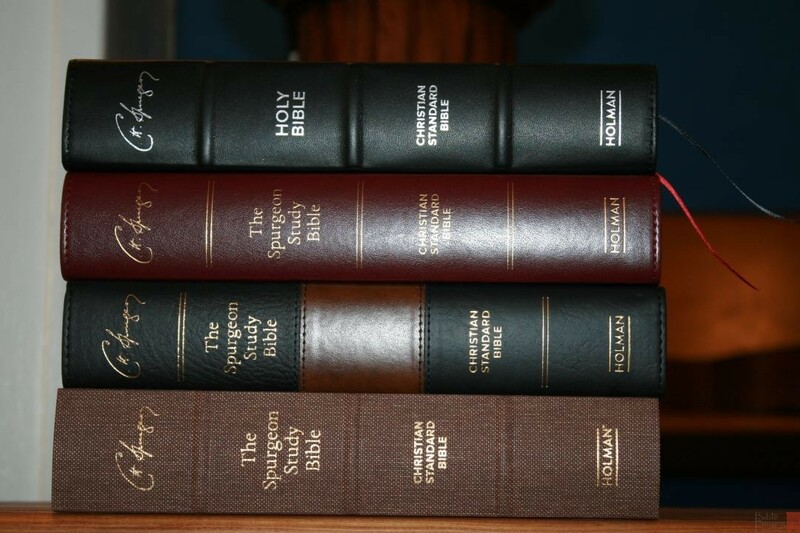 All have Spurgeon’s signature on the spine. The overall size is 9.5 x 7 x 1.75″ and they each weigh 3 lbs, 3.7 oz. 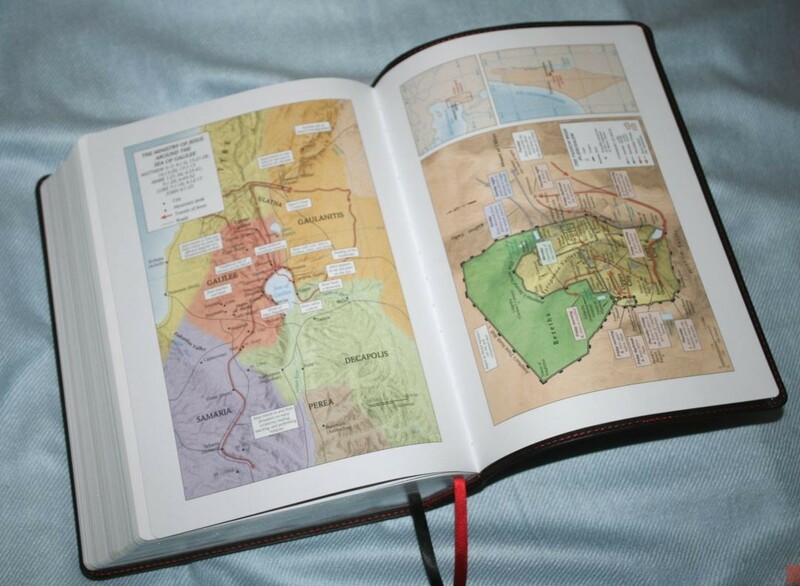 It’s within the typical range of a study Bible. All have 2 ribbons in colors that match the cover. All but the hardcover come with a 2-piece box. To simply call this a “hardcover” is really understating this cover. 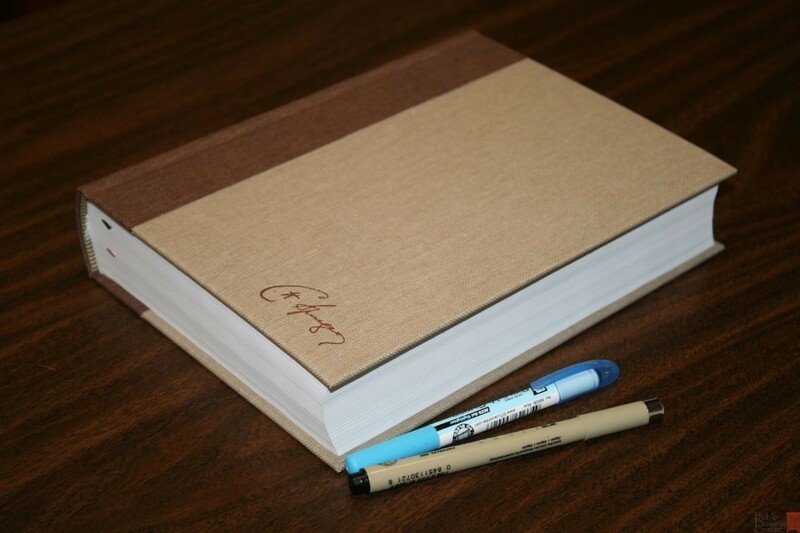 It’s actually a 2-color cloth over board with a brown spine and oatmeal/tan front and back. The liner is somewhere around the toupe range of colors. The front includes Surgeon’s signature in brown. The text on the spine is printed in gold. The spine includes 3 raised ribs. It includes one brown and one tan ribbon, and tan and brown head/tail bands. Page edges are not gilted. This might be my favorite imitation leather ever. It has a real leather look with brown across the middle. The black is matte while the brown is probably a satin. I love these colors together. The thread around the perimeter is black. 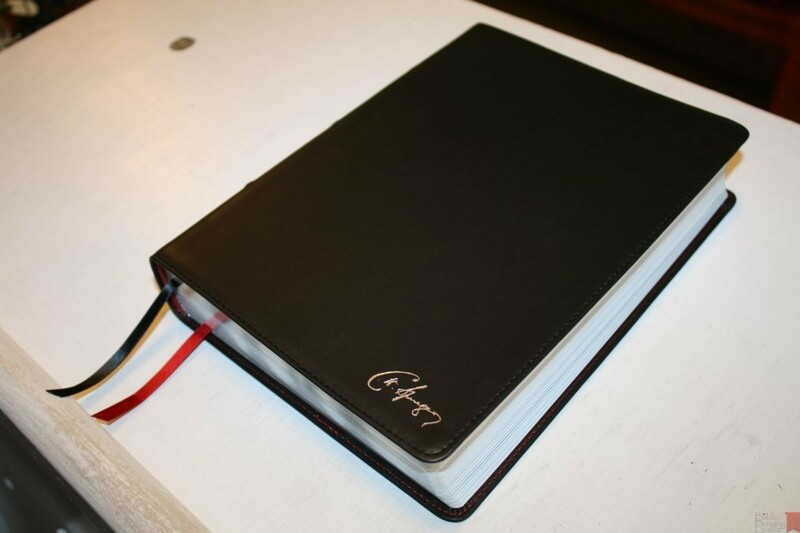 Spurgeon’s signature is debossed into the brown imitation leather. The text and spine rib indications on the spine are printed in gold. It includes one black and one brown ribbon and black head/tail bands. The liner is dark brown. It has a slightly larger yapp than the genuine leather edition. This edition has gold gilted edges. 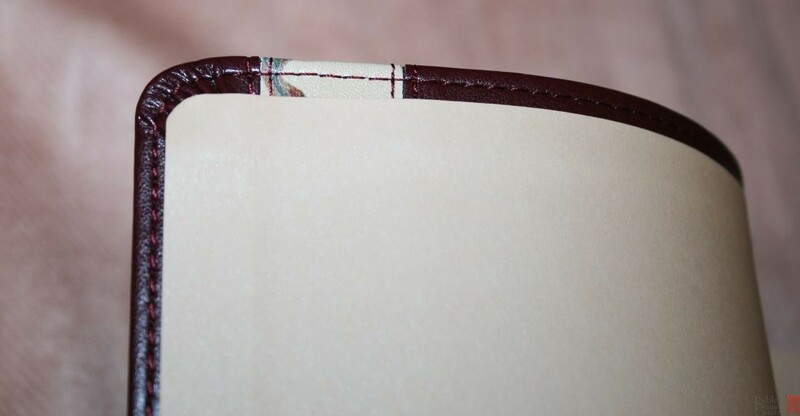 This one has a rich burgundy color with a marbled strip down the outer edge. It has a satin finish with a nice texture. The colors of the marbled section match the burgundy well. The thread around the perimeter is burgundy. The liner is a deep cream with a touch of orange under certain lighting. Maybe I would call it peach. The text on the spine is gold. It has a slightly smaller yapp than the block/brown edition. It has one cream ribbon and one dark red ribbon and burgundy and white head/tail bands. This edition has gold gilted edges. 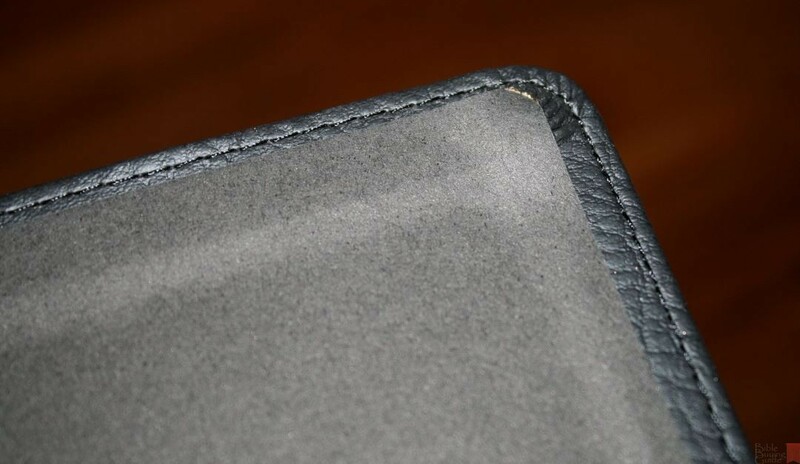 This edition is marketed as genuine leather, but this isn’t typical genuine leather (which is almost always pigskin). This one is actually goatskin. This is the most elegant and most flexible of the covers. It lies open on page one right out of the box. 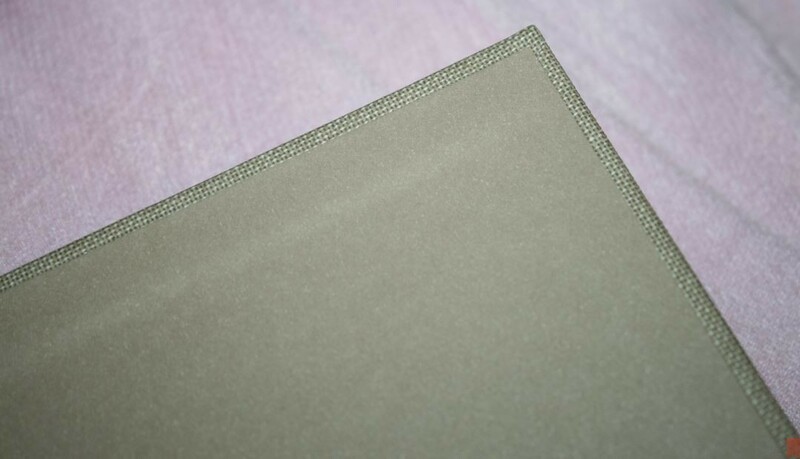 The grain is smooth, with almost an ironed look and feel, but it does have a slight pebbly grain. It has close to no yapp (where the leather hangs over the text-block). The liner is black vinyl. The threads around the perimeter are black on the outside of the cover and red on the inside of the cover. Spurgeon’s signature is stamped onto the front in silver. The text on the spine is printed in silver. It has 3 raised spine ribs. It includes one black and one red ribbon, and red and black head/tail bands. The page edges are silver gilted. I’d love to see this cover with an edge-lined leather liner. Still… this is a goatskin outer shell at a genuine leather price. The paper is somewhere around the mid 30’s in gsm. It’s white in color and has a rough texture that’s easy to turn and great for highlighting. It’s highly opaque. It has no glare under direct lighting. 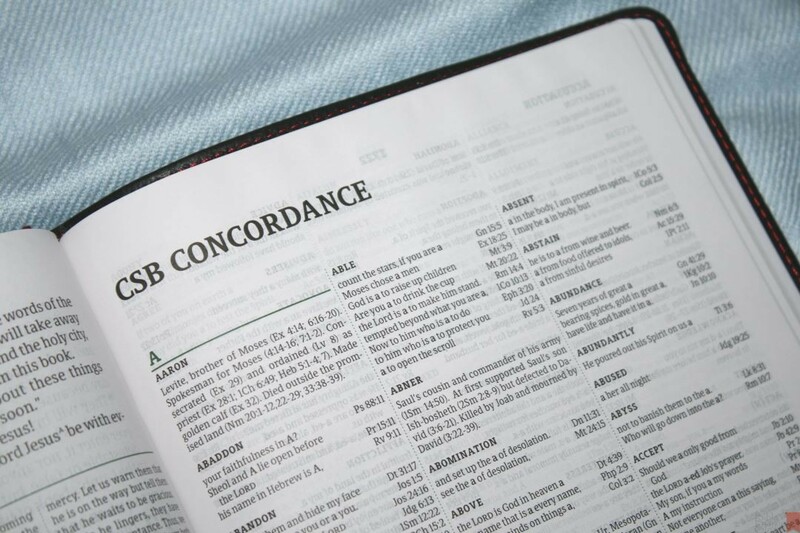 Each edition includes a presentation page with Rev 22:6a printed at the bottom within the CSB logo. The text is presented in the standard CSB double column paragraph layout. Old Testament quotes are in bold. Letters are indented with ragged edges. Poetry is set to stanzas. 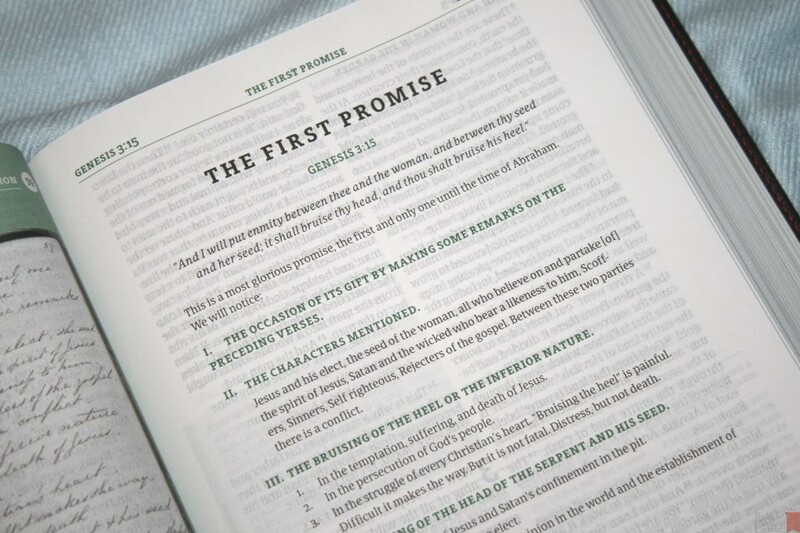 The header displays the page number in the center and book name and chapter number in the outer margin – all printed in green. Notes are placed at the bottom of the page in four columns with a much smaller print than the text. Throughout the text are quotes from Spurgeon in a script font that looks like it could have been derived from Spurgeon’s handwriting. At the very least they chose a typeface that was a close match. The notes are separated from the text with a green horizontal line. The typeface is 2/K Denmark’s Bible Serif. It’s 10 point black letter with generous leading. It’s highly consistent throughout and a joy to read. The only distractions in the text are section headings and footnote keys. Section headings are in all-caps and bold. Footnote keys are tiny superscript letters that I find easy to ignore. 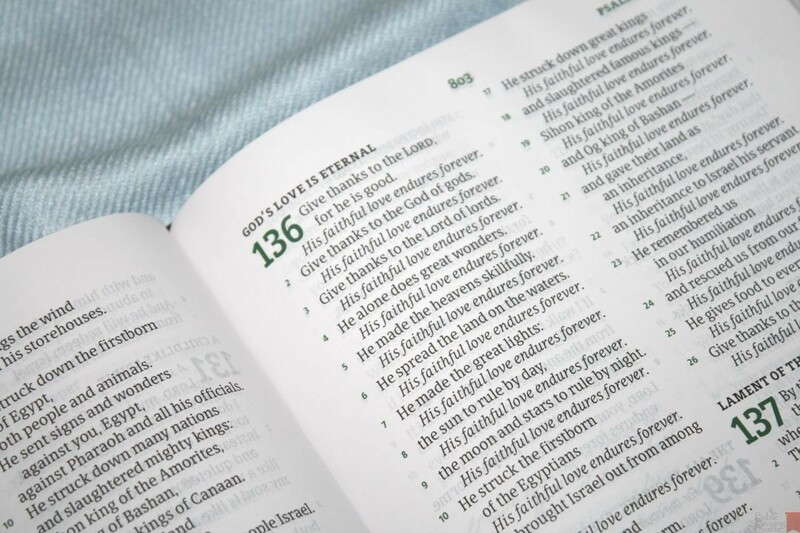 Verse and chapter numbers are in green. The verse numbers are easy to find but they’re also easy to ignore. It has around 46 characters per line with around 7-9 words per line. The margins are 5/8″, which gives you some space for small notes and helps bring the text out of the gutter to the text never gets lost in the bend. The text is printed with line-matching, so the lines of text matches the location on both sides of the page to improve readability. The CSB footnotes are keyed to the text with letters and are placed at the bottom of the page on the right side. They’re printed within a green box so they stand apart from the text. They show the chapter and verse number in bold. They cover manuscript variations, literal renderings, alternate renderings from the original languages, where Hebrew is difficult to translate, etc. 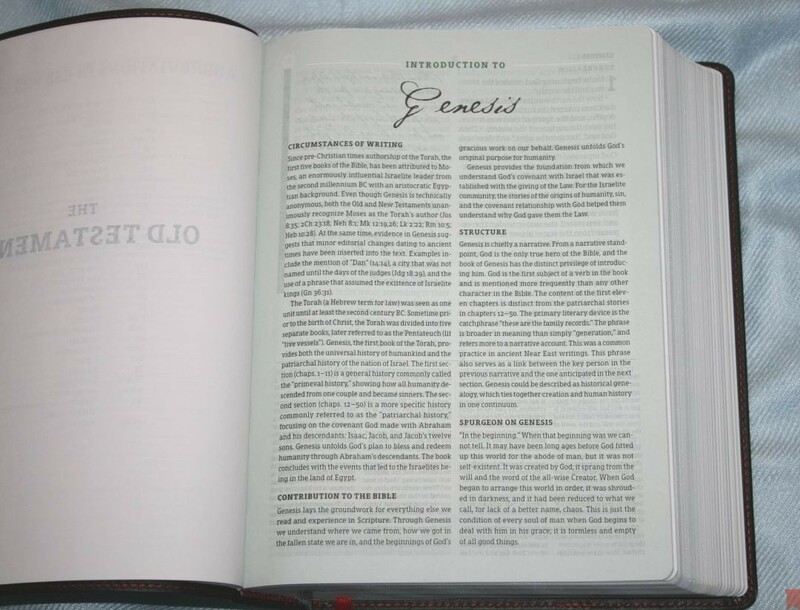 A four page biography of Charles Spurgeon helps introduce this study Bible. It tells of his life and ministry, and makes comparisons with several characters from the Bible – most notably John the Baptist. This is a well-written and informative essay by Alistair Begg and I highly recommend reading it. In the front is an index that provides the page numbers for the lost sermons, quotes, and illustrations. 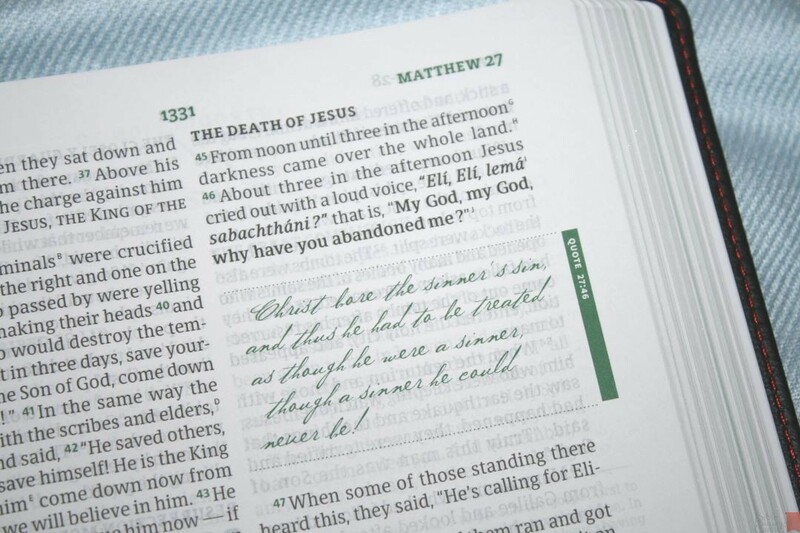 The lost sermons shows the name of the sermon and the Scripture reference for the sermon. 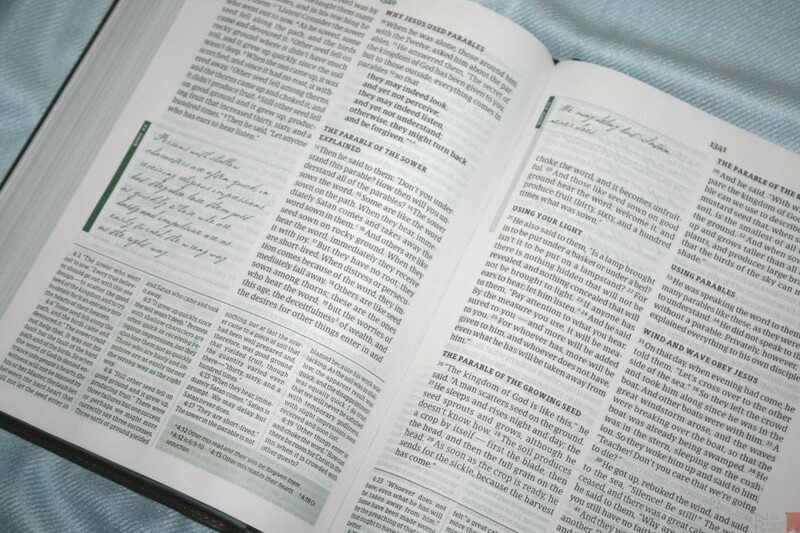 Quotes and illustrations provide the Scripture reference. This is handy for seeing which Scriptures have a note from Spurgeon. 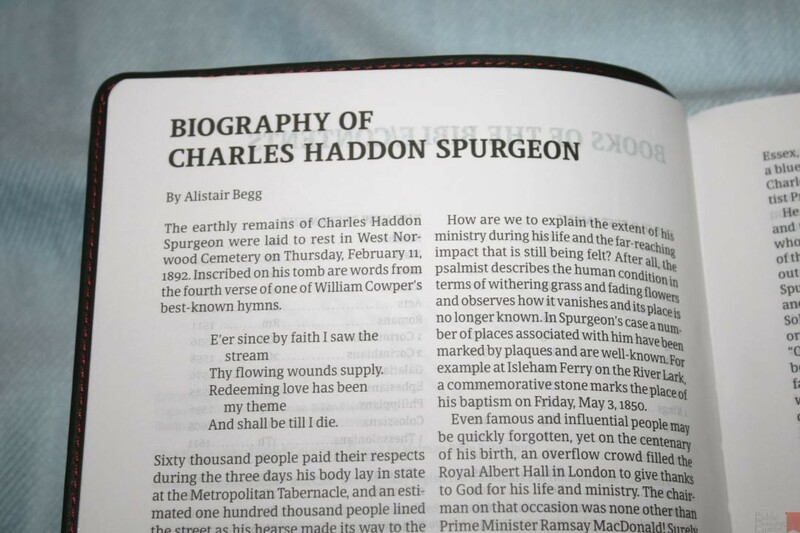 The book introductions are derived in part from Spurgeon’s writings. 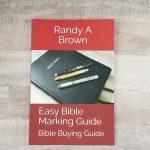 They take about a page and discuss the circumstances of writing, its contribution to the Bible, structure, and Spurgeon’s thoughts on the book. They include key verses, dates, key characters, events, etc. They’re well-written and informative. They’re printed over green so they stand apart from the rest of the text and show the book’s name in Spurgeon’s own hand-writing. The footnotes repeat large portions of verses, and sometimes the whole verse. 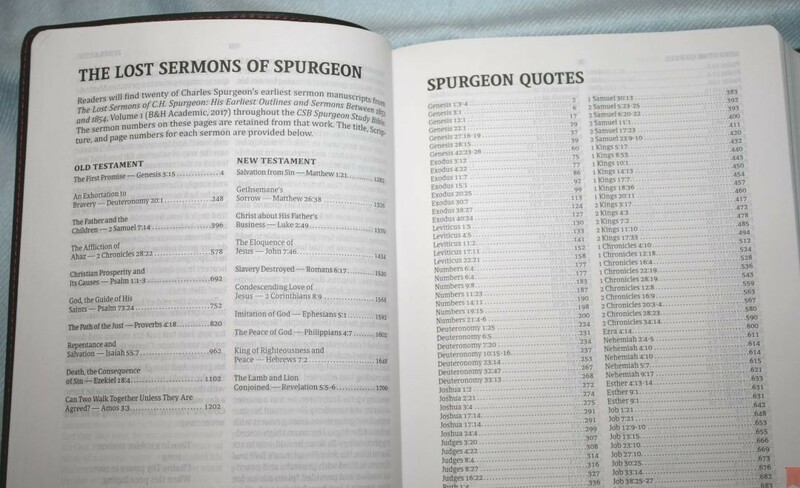 They’re placed within quotations to help them stand apart from Spurgeon’s notes. The footnotes are not meant to be a verse-by-verse commentary. They provide Spurgeon’s thoughts in passages. They have more of a devotional feel than a theological commentary. Most of them are applicable regardless of denomination. This is by far the easiest way I know of to see what Charles Spurgeon said on any particular passage. 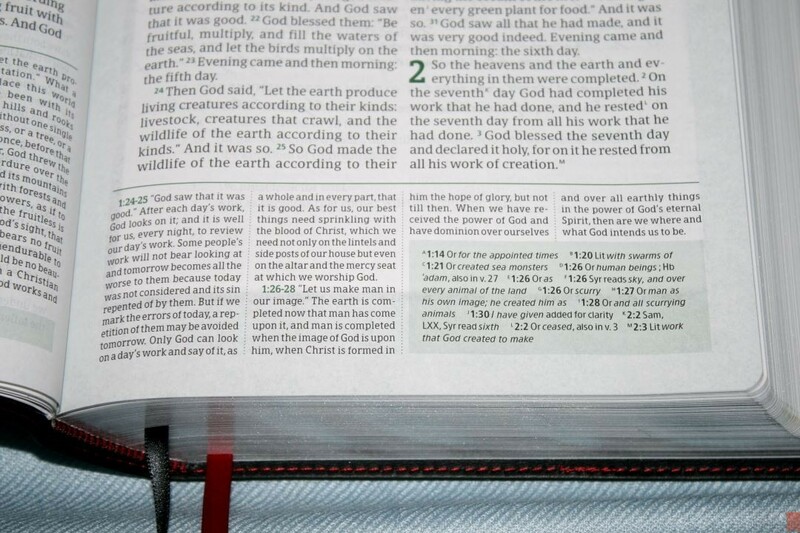 Of course the nature of study Bibles requires many verses to be skipped in order to fit within the space of the Bible. This means there are lots of verses that will not have notes. There were several verses that I hoped to see notes but there were none. That can’t be helped in a study Bible of a manageable size and it does have a lot of notes. I always recommend readers to use commentary for reference and do their own study. With that said, most of Spurgeon’s notes feel more like they’re encouraging me than telling me what to believe. Quotes from Spurgeon are placed within the text in hand-written script font that looks similar to Spurgeon’s hand writing. 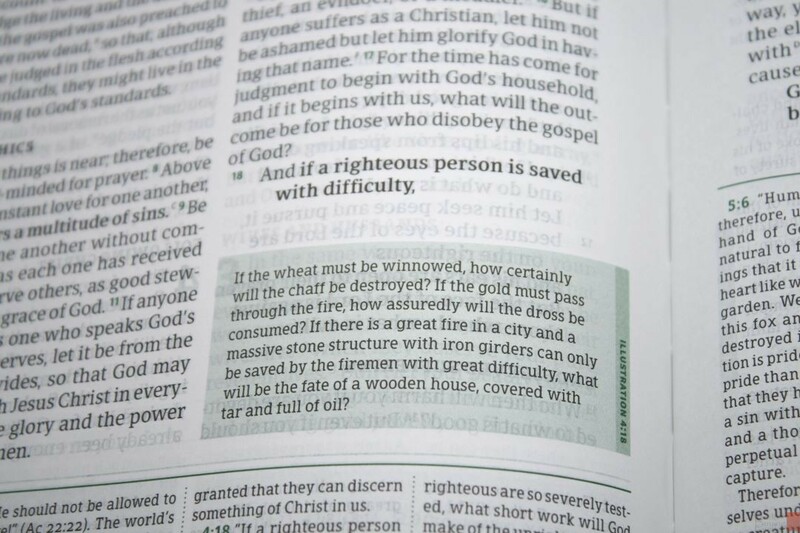 Spurgeon’s quotes are also placed within the notes, printed in a bold green font so you can identify it as the quote. They provide a short thought on a specific verse, which highlight insights. There are lots of them throughout this study Bible. There are around 400 of them. 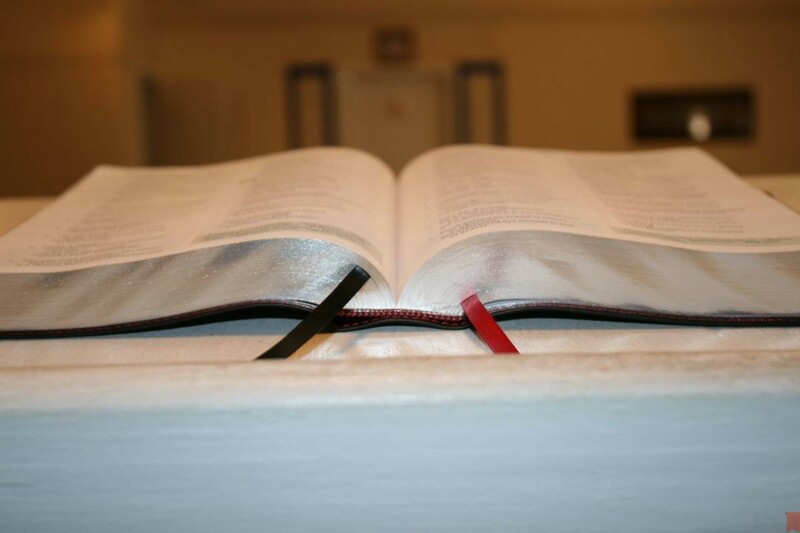 There are 20 lost sermons that are placed throughout the Bible. They’re from The Lost Sermons of C.H. Spurgeon: His Earliest Outlines and Sermons Between 1851 and 1854, Volume 1 from B&H Academic. 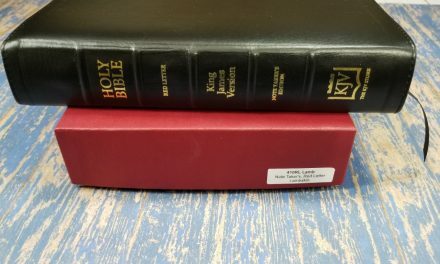 They take two pages – one page is a scan of the hand-written sermon and the opposing page is the sermon printed with the Bible Serif typeface. Preachers in particular will love seeing these as they show Spurgeon’s method of creating sermon outlines. We all have our methods and I find it insightful any time I can see someone else’s method. When that someone else is Charles Spurgeon I consider that a score. 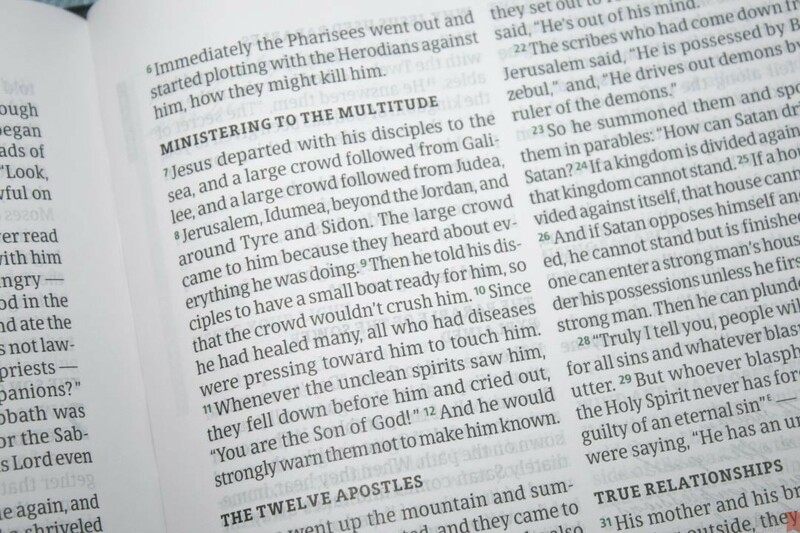 Short sermon illustrations are placed within the text in a green box to help them stand apart. It provides the references they correspond to. These are short points and applications taken from the text. They’re both descriptive and insightful. I found it informative to see how Spurgeon developed illustrations from the text. There are around 60 illustrations. 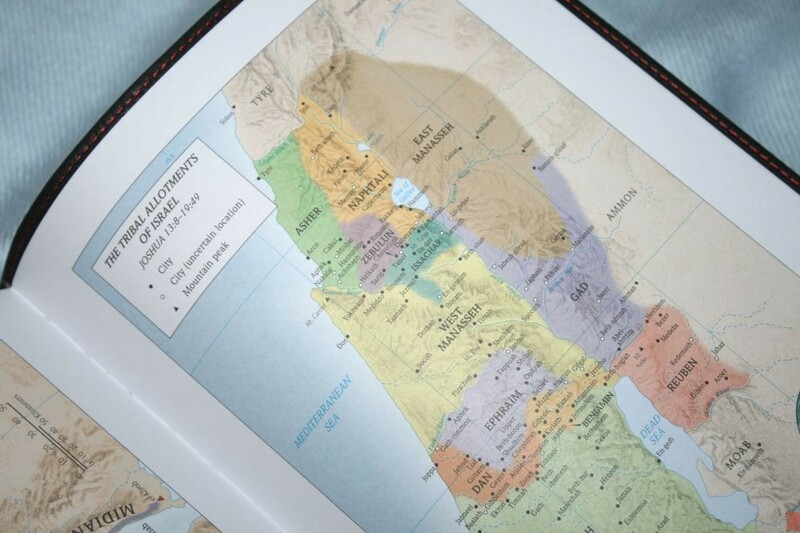 It includes 8 full-color maps on thick non-glossy paper. They’re colorful without looking too cartoonish. They show distance, topography, mountain peaks, routes, cities, major roads, Scripture references, location on the globe, kingdoms, locations of events, dates, etc. 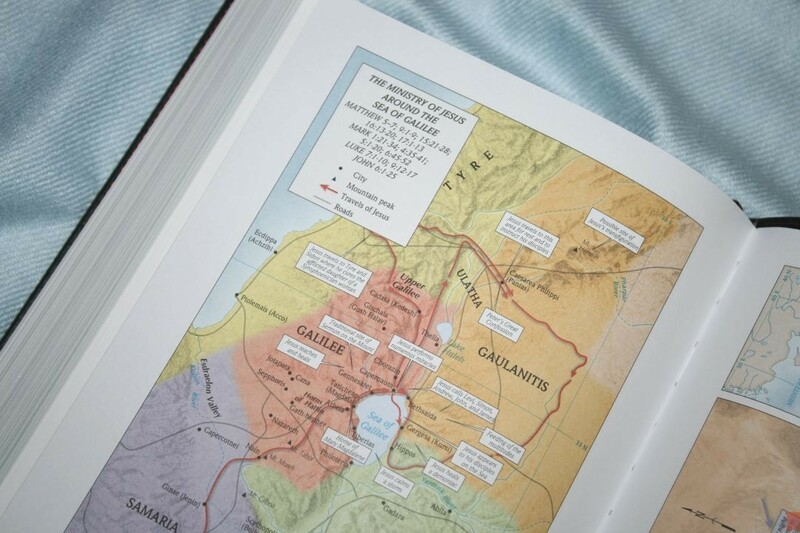 They’re easy to use and are annotated well, which is helpful since it doesn’t include an index to maps. Holman has produced a high-quality introduction video with Alistair Begg. I found it informative and thought you would too. 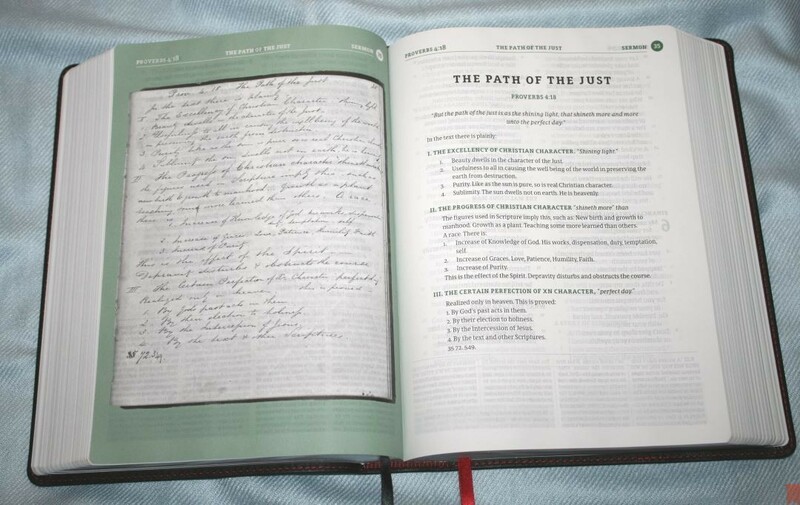 Holman’s CSB Spurgeon Study Bible is one of the highest quality and most interesting study Bibles that I’ve seen. I love the paper and print and the price is great for what you get. 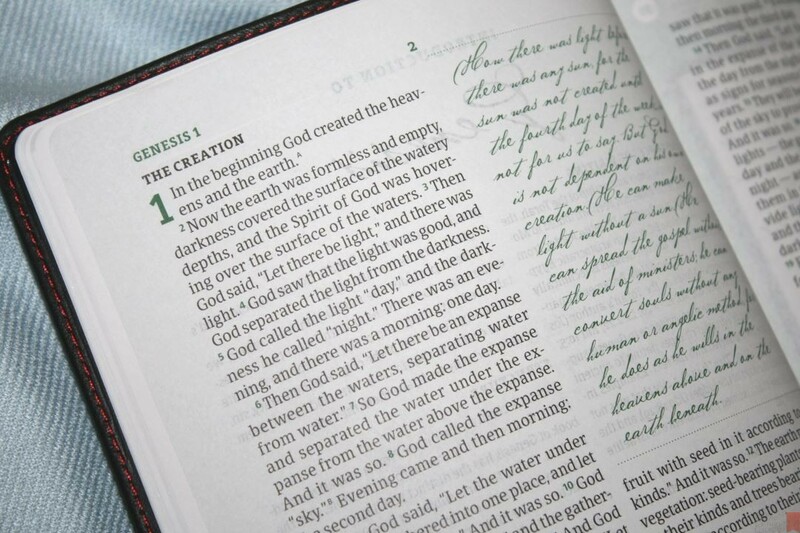 The design of this Bible is simply brilliant. It looks like a Quentel with study notes. It even has enough margin space to make some small notes. I like the use of green highlights. 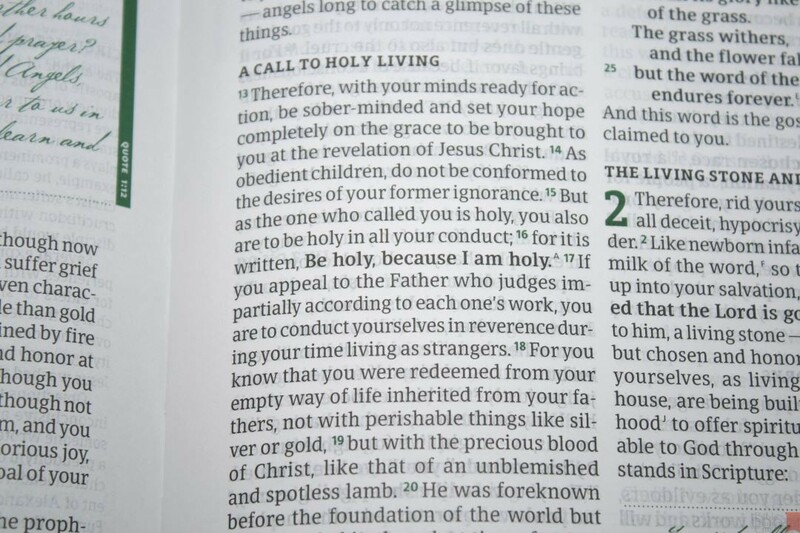 This makes the verse numbers both easy to find and easy to ignore. Holman really should talk up their covers a little more. These covers are far better than the marketing department would tell us. 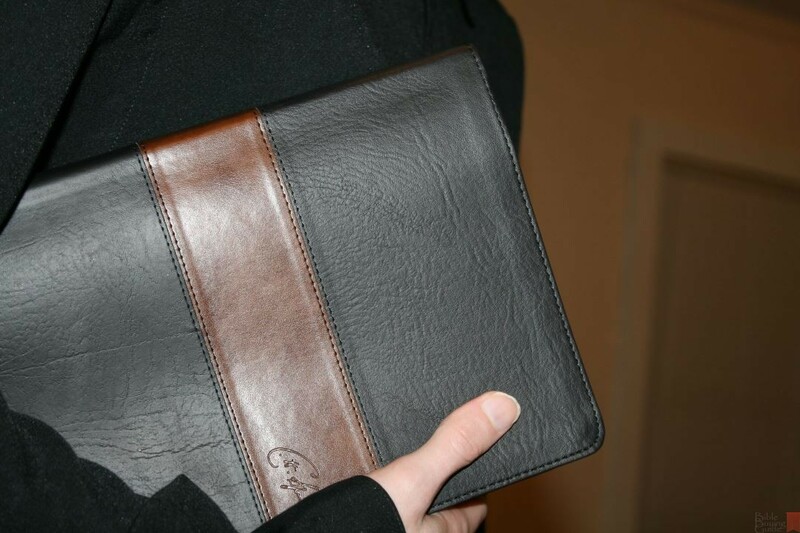 The genuine leather is actually goatskin with raised ribs. 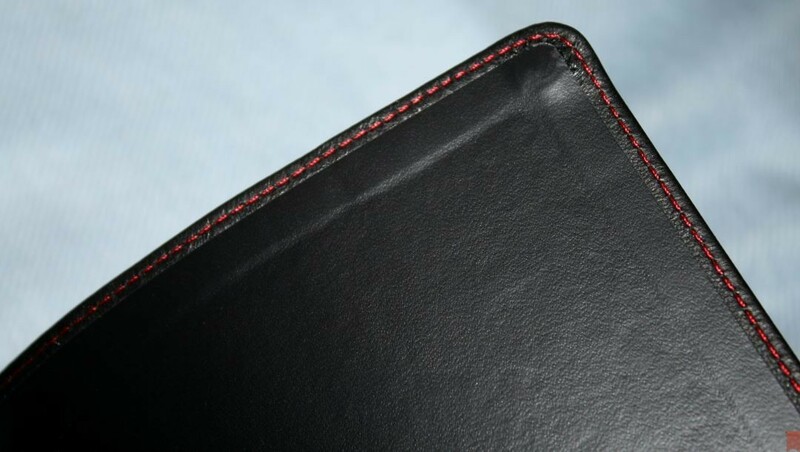 The hardcover has two colors of cloth and raised ribs. Even the imitation leather editions look and feel elegant. Holman under-promised and over-delivered on each of these covers. 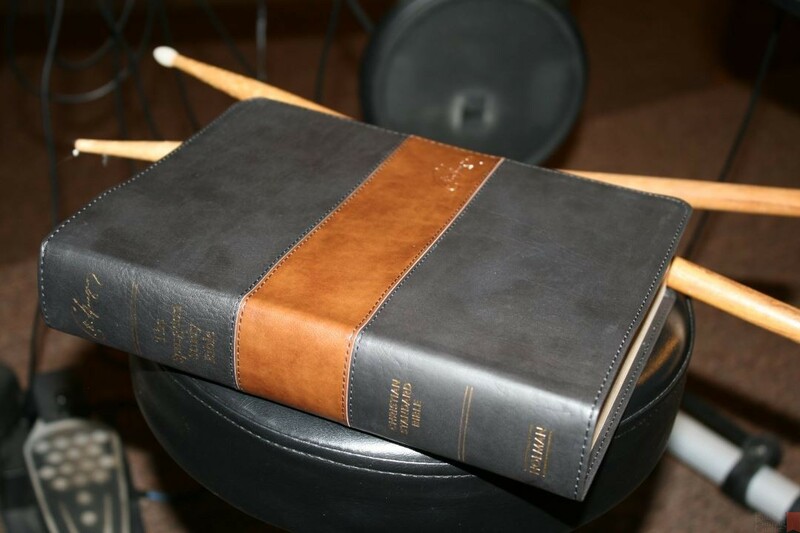 This isn’t a study Bible with tools to do your own study. You won’t find word studies, topical lists, theological articles, etc. It doesn’t even have cross references. Many have moved to placing them within the notes. This one has very few within the notes. It isn’t meant for that. 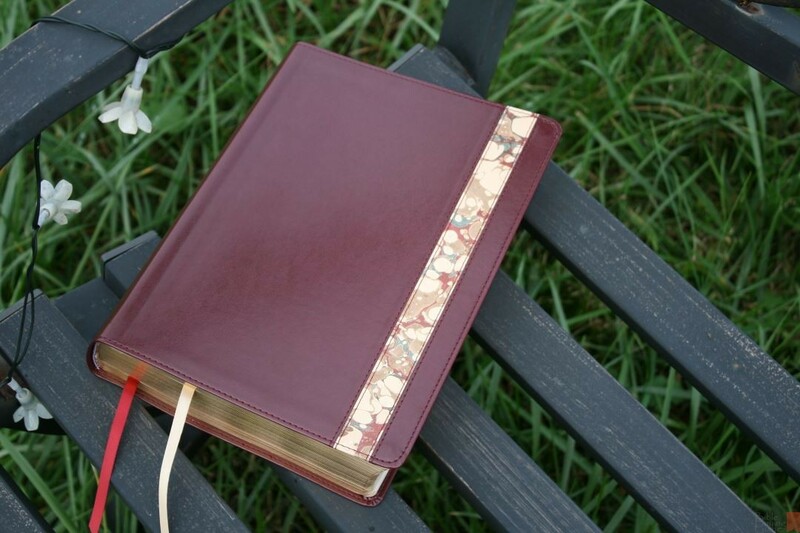 Its purpose is to provide Spurgeon’s teachings along with the Scriptures. 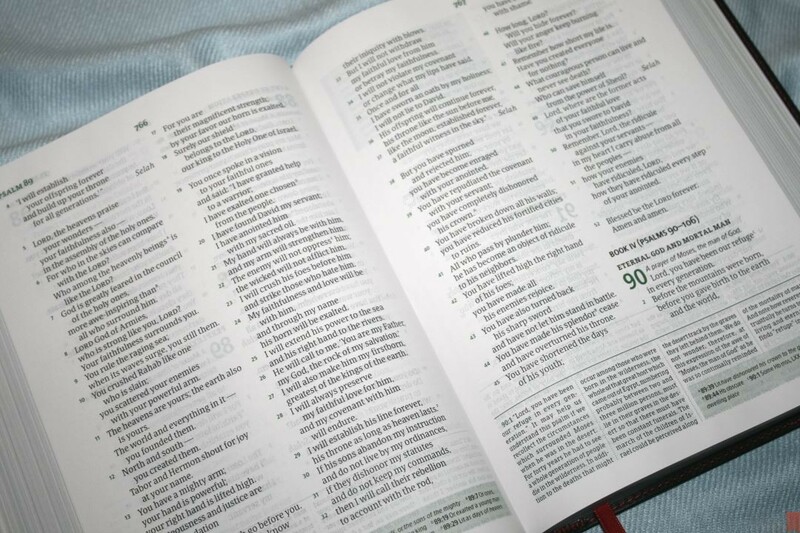 The result is a cleaner Bible with a single purpose. The result is Spurgeon’s teachings on Scripture and it’s great for reading along with your study and for reading as a devotional. 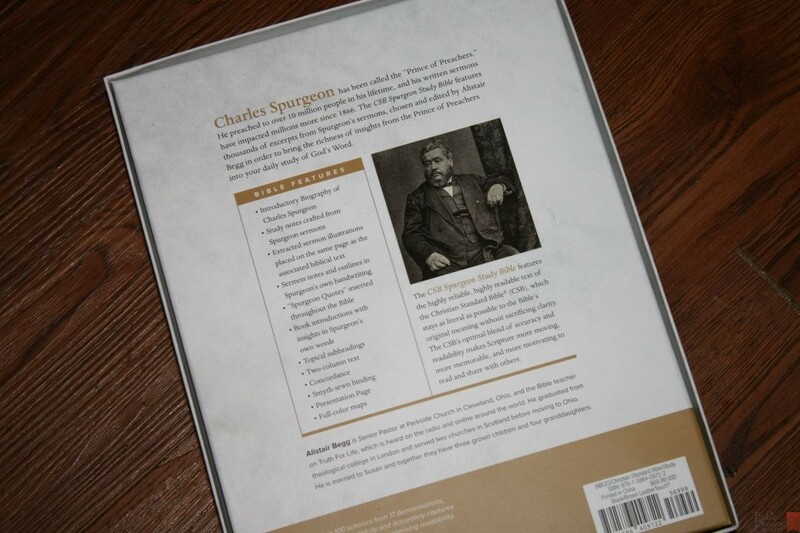 Holman has hit a home run with the Spurgeon Study Bible. 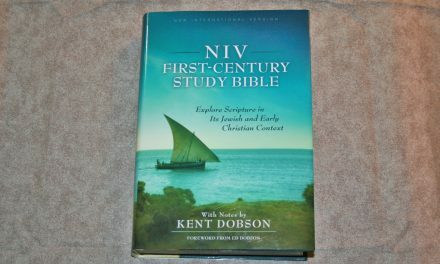 This is on my short list of favorite study Bibles. 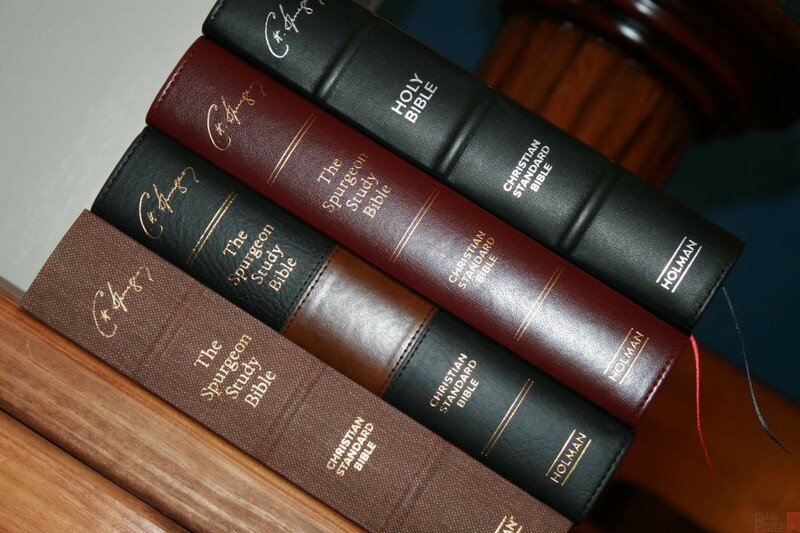 I recommend the Spurgeon Study Bible in any of the four covers. That looks fantastic! I wish it came in NKJV or NASB. 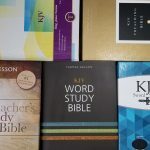 Just when I said to my self, “ having another bible is becoming and habit, I cannot justify , I need to be released from such things “, two things happen; Alester Begg edits a study bible, and it has the name Spurgeon on the cover. Holman wins a prize for reintroducing a treasure to the church. Spurgeon’s Study Bible has been on my wish list ever since it was introduced. After your detailed review—thank you!—I’ll purchase it much sooner than later. That’s great to hear! I’m sure you’ll love it. 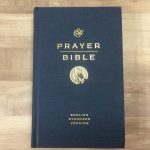 Having trouble ordering it on Christianbook.com….tried 4 times. Really want to get it!!! Are all the notes by Spurgeon or just interspersed with Holman notes? What a pity is didn’t come in KJV. Hi Kevin. They’re Spurgeon’s notes. Anyone know if there is a large print version available? Hi Heather. Unfortunately it isn’t available in large print. I may have missed this but what is the bold text throughout for? I just received my bible and absolutely love it! Going right to Romans for my first study with it! Hi Matthew. The bold text indicates OT quotes. I should have mentioned that. Sorry about that. Red letter words of Jesus?